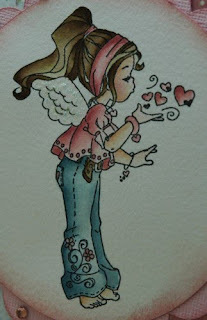 I got my new distress inks, and have celebrated that by making a pink card. Excited that there finally excists a decent pink colour without having to mix (less work-me happy :) ). Victorian velvet has the most beautiful shade of pink!! Have made a card using Maya's sketch at sketch saturday this week. 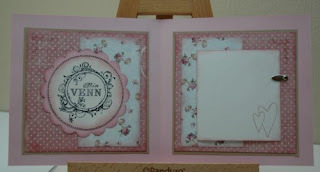 Patterned papers are from Maja design and Papirdesign, and I cut the scalloped circle using my cricut (Mini Monograms). Sentiment is from Norsk stempelblad. 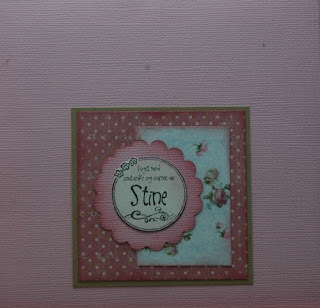 Oh Stine, what a darling card! It so kills me that I can't have ALL the new inks! LOL! Someday! 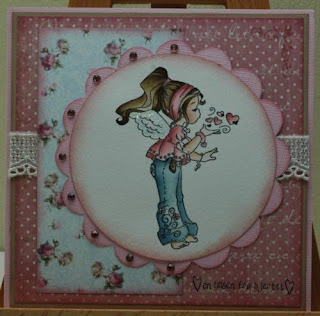 Love the softness of this card and again, your coloring is gorgeous!